This afternoon dress belonged to Lady Dovercourt. It is an outstanding example of Madeleine Vionnet's art. She was born in 1875 in Aubervilliers, France, and was apprenticed to a seamstress at an early age. She worked in the Paris suburbs in her late teens before joining Kate O'Reilly, a London dressmaker. In about 1897 Vionnet returned to Paris. She worked with David Bechoff, Callot Soeurs and Douçet before opening her own fashion house in 1912. Her work was interrupted by the First World War (1914-1918), but she reopened in 1918, moving to 50 avenue Matignon. She retired in 1939. 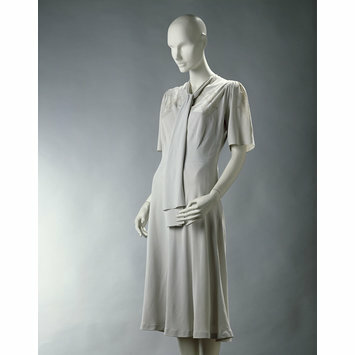 Vionnet was master of the bias-cut dress, which moulds the body without restriction and flows with its movement. In this garment her bias-cutting techniques allow the matt silk crêpe (woven to her specifications) to follow the contours of the body. The bodice front has intricate, meticulously executed drawn threadwork. The bodice back and sleeves take their diamond-shaped grid from the lie of the warp and weft in the fabric. The zigzag openwork seam that joins the neck yoke and bodice provides more flexibility and suppleness than a conventional seam. Pale blue silk crêpe day dress and matching silk crêpe de Chine petticoat. 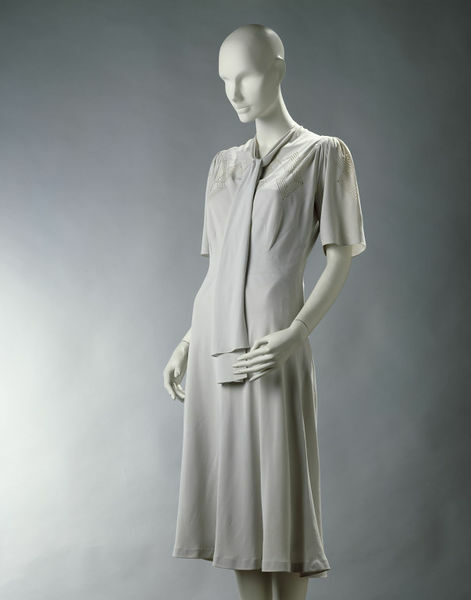 Silk crêpe day dress and silk crêpe de Chine petticoat, designed by Madeleine Vionnet, Paris, mid 1930s.